An Englishman Solves American Puzzles: NPR Puzzle 6/6/10 -- Oh, Say Can You See? A "spoonerism" is when you interchange the initial consonant sounds of two words to get two new words. For example, with "right lane," you'd get "light rain." Think of a familiar two-word phrase that's an instruction seen on many containers. "Spoonerize" it to name two things seen at the beach. What's the phrase and what are the things? 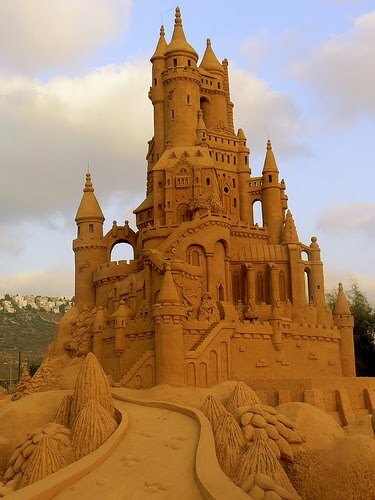 I'm a sucker for sandcastles. Here's a beauty, from a beach in Haifa. Last but not least: surf. 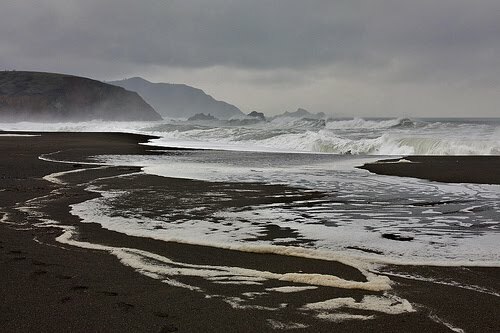 The photographer who took this picture of Sharp Park State Beach in northern California insists these are big waves. I'll take his word for it. I hope there's something about these photos (but not *in* them -- we try to be a spoiler-free blog) that sparks the answer for you. 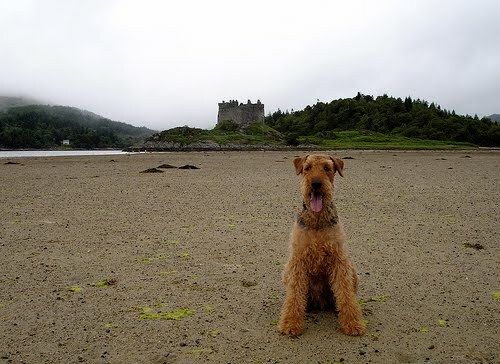 With "just over 1,100 entries," Mendo Jim won last week's Guess the Entries Game. MJ: send your address to either Magdalen or Ross at Crosswordman.com and we'll mail out your prize. And everyone else, let's play again, shall we? Just a reminder: You're guessing the range that you think includes the number of entries NPR get for this beach-theme puzzle (above). Leave a comment with your guess; first come first served, so read existing comments before you guess. Ross and I guess last, just before we publish the Thursday post. I select the 1100-1200 range for this week. Not sure my answer is correct so no clues to give. 1000 - 1100. I think that I have the write answer. I did just fine this week. The answer hit me right away. I'm in for 1500-2000. I think I got it, no clues though. Must be fewer listeners as the number of entries are not corresponding to how hard the puzzle seems to me. I think it's easy but I'll take 1200-1300 range. I agree with Marie, the number of correct entries doesn't seem to correlate to the dificulty of the challenge. I'll take 1,400 - 1,500 this week please. I won, I won!! First I'd like to thank the Academy.... No, that's for another venue. 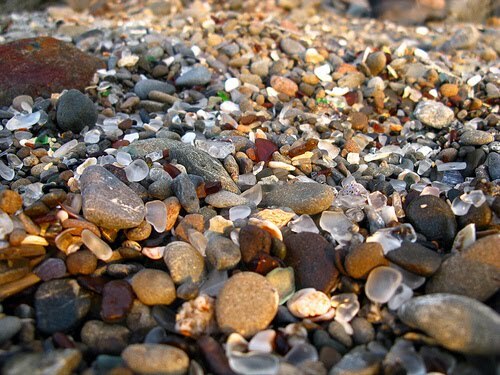 Before I forget, that pic is Glass Beach in Fort Bragg; it is the old (1800's) town dump and has been a favorite place for tourists for years. It is only about an hour from me and is now posted to please leave the neat things behind, but alas too late; it hasn't looked that rich for years. Today's challenge is too easy need a hint. It also shows Doctor S's lack of appreciation for Spoonerisms, which should make a statement both ways. For a famous example: "you tasted two worms" for "you wasted two terms." There are dozens of entertaining examples on the web, albeit not very many provably the Reverend's. Just to see if my status as reigning champ can influence the turnout, I'll take 5000, but probably not a new record.